Rapper Eminem addresses Nicki Minaj dating rumours. Rapper Eminem responds to the rumours that he's dating Nicki Minaj. Cue more confusion. 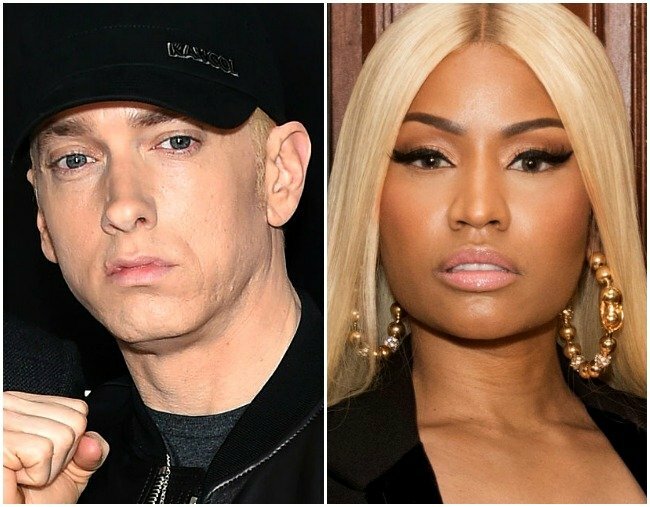 The celebrity rumour mill has been busily grinding away ever since rapper Nicki Minaj hinted in her latest song ‘Big Bank,’ that she was dating fellow rapper Eminem AKA Slim Shady AKA Marshall Bruce Mathers III. You can’t really blame fans for jumping to the conclusions that were clearly laid out for them. To confuse things even more, Eminem himself then commented on her Instagram video with Minaj’s response adding more fuel to the situation. Despite this, we have zero actual confirmation of whether they&apos;re dating or not. Well, that is, until now. Maybe. Kind of. Performing at the Boston Calling music festival on Sunday night, the 45-year-old chose to crowdsource the audience&apos;s opinion of #Nickinem. "Let me make sure so I can actually make this official," he began. "How many of you want me to date Nicki Minaj?” he said, with fans responding with screams and cheering. “Well, god dammit, me too. Nicki, if you get this message, just text me later, we’ll talk about it," he said. Previously Minaj has dated rapper Meek Mill, with engagement rumours flaring up after she posted a photo of a stunning heart-shaped diamond ring on her engagement finger. Despite this, the couple ended their relationship in January of 2017. Eminem prefers to keep his personal life private, but has been rumoured to have dated Geri Halliwell, Mariah Carey (although Carey has denied this) and his 8 Mile co-star Brittany Murphy. His longest relationship was with Kimberly Anne Scott who he shares three biological children and has been married to twice - once for two years in 1999 and then again in 2006, however their second marriage only lasted for three months. Although this puts an end to any rumours of Minaj and Eminem dating, we&apos;re wondering if anything will actually come of this?